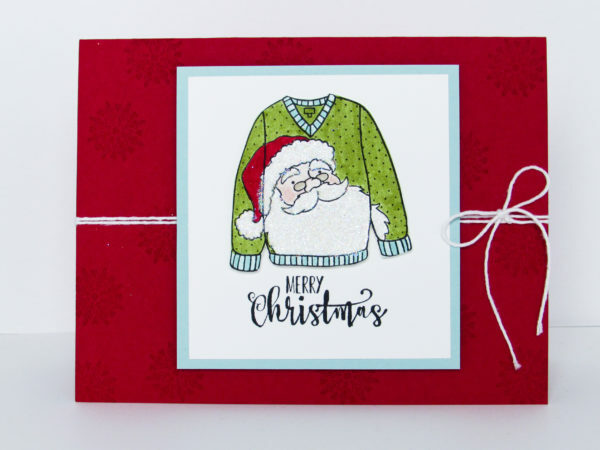 Today’s Santa Sweater card was designed using the Stampin Up Christmas Sweaters Stamp Set. This set is featured in the 2017 Holiday Catalog. It’s understated and easy to miss. To create the snowflake back ground, I used the Stampin Up Cheers to the Years stamp set to randomly stamp snowflakes. My favorite part of the sweater is all the dazzling diamonds glitter. It really adds sparkle and pizzazz. Don’t forget to add some color to Santa’s face. Otherwise, he looks like a ghost. Lol!! 1. Cut a 8-1/2″ x 5-1/2 piece of real red cardstock. Fold it in half. This is your base. 2. 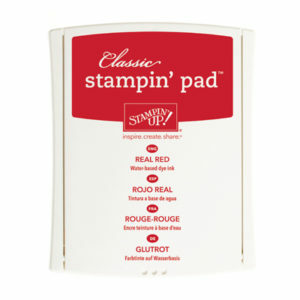 Use real red ink to randomly stamp your small snowflake on your card base. 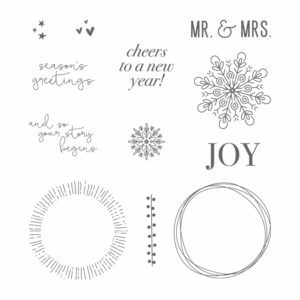 Tip: The small snowflake is from the Cheers to the Years Stamp Set. 3. 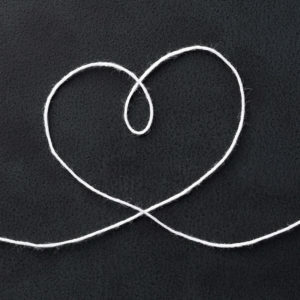 Next, wrap a piece of solid white bakers twine around your card twice and tie a decorative bow on the right side. 4. Cut a 3-1/4″ x 3-1/2″ piece of soft sky cardstock. 5. 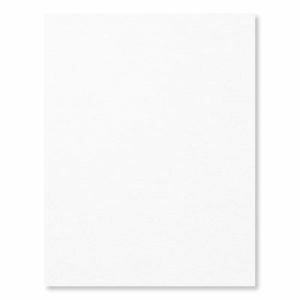 Cut a 3″ x 3-1/4″ piece of whisper white cardstock. This piece is for your Santa Sweater. 6. 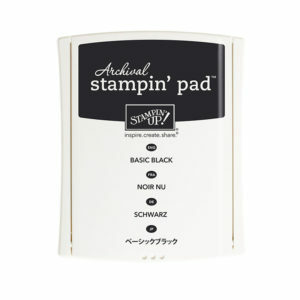 Use archival black ink to stamp your Santa sweater & sentiment on your Whisper White Cardstock. 1. 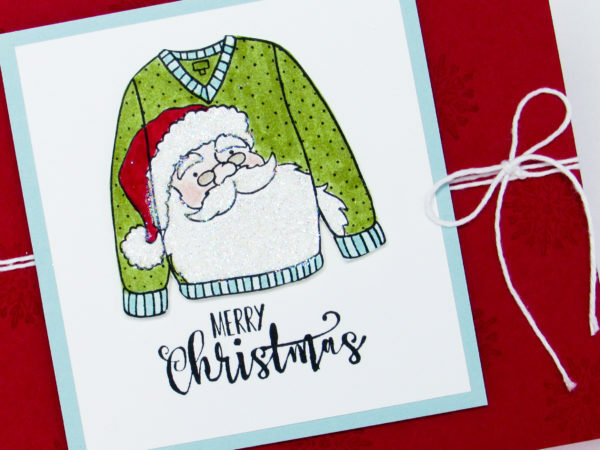 Color Santa’s sweater using Stampin Write Markers. Tip: The colors I used to color Santa and his sweater are: Old Olive (Sweater), Real Red (Hat), Pool Party (Sweater Trim), Blushing Bride (Face & Checks) and Sahara Sand (Glasses). 2. Use multipurpose adhesive or the fine tip glue pen to add the glitter to Santa’s mustache, eyebrows, beard and hat pompom. 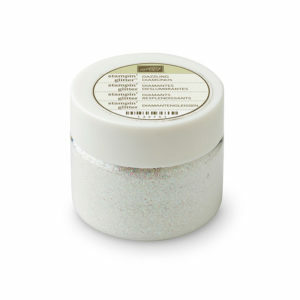 Tip: Be sure to tap off an access glitter! 3. Center and adhere your whisper white rectangle on top of the soft sky rectangle. 4. Use dimensionals under your soft sky cardstock to adhere it to your card base. 5. 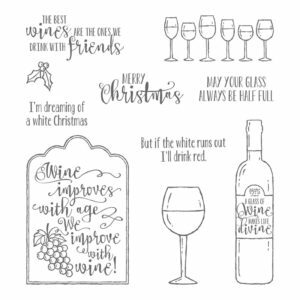 Lastly, cut a 4″ x 5-1/4″ piece of whisper white cardstock and layer it inside your card. THIS IS TOO MUCH FUN…. So very cute. Thanks for your fun tutorials. I loved the video but then I like all of yours. On the sweater with lights add more color to the lights, try red, green and some yellow to them. Keep up your wonderful work. I thought you used the Dazzling diamond glitter in a really effective way on the Santa jumper and cutting this out and putting it on dimensionals made it pop from the card stock. I am not surprised you chose this one to do first because it certainly is the one that stands out from the rest. I have been thinking about the one with the Christmas lights on it. Perhaps you could make the jumper a fairly light colour like pool party but water colour this and then with the markers colour in the Christmas lights. 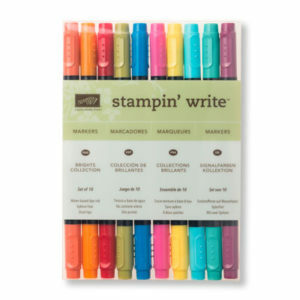 These could be enhanced perhaps with Glossy accents. I thought perhaps for a bit of fun the jumper could have an electrical lead drawn from it with an electrical plug on the end. Great ideas though, thanks Brandy. So very cute your sweater card turned out. Love all about it—thans for showing and sharing. 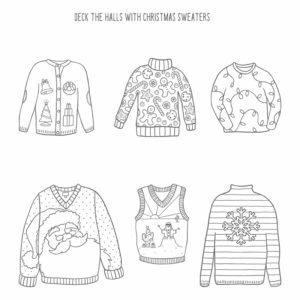 Brandy, I as well missed this sweater stamp set in the holiday catalog. Still not sure I’m in love with it, but I am.definitely adding it to my WL so I can play aroundd with it myself. 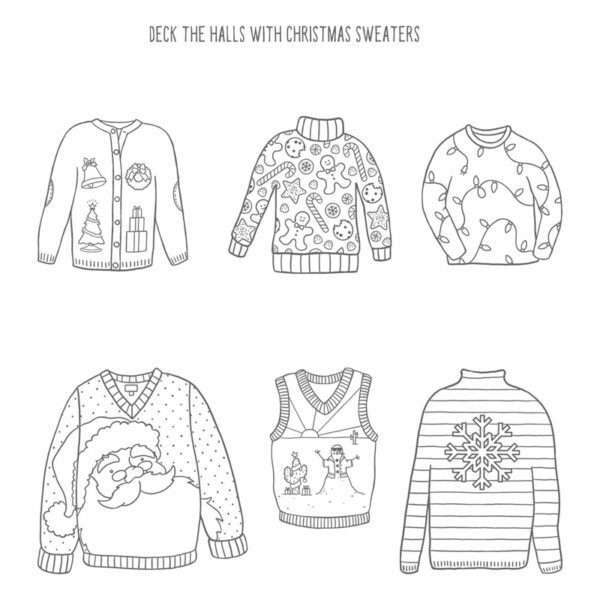 Thanks for showing us what beautiful cards can be made with christmas sweater Stamps! Love all your videos, so Thank You for taking the time to make them!